This beautiful green soup mix is so festive and green! 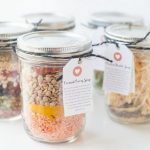 Layer all ingredients in a clean glass jar (pint size) in the order listed. Close lid, add tag, and gift. Remove wrapper from bouillon cube and add it, plus all remaining ingredients, plus four cups of water to a saucepan. Bring to a boil over high heat, reduce heat to low, and simmer until the peas are tender, about 30 minutes. Remove and discard the bay leaf. Stir in one cup of chopped ham before serving. Season to taste.